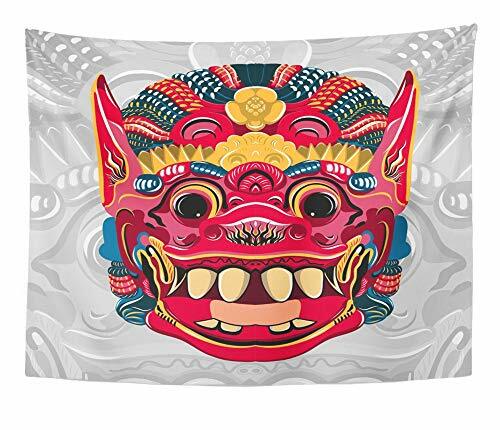 Makes a great Wall Hanging, Beach towel, Couch Cover, dorm room tapestry, Yoga Mat, tablecloth, and other home decor. Tapestry Wall Hanging with Art Nature Home Decorations for Living Room Bedroom Dorm Decor in 60x80 Inches. Wash separately - DO NOT WASH WITH OTHER ITEMS - DO NOT tumble dry - DO NOT use bleaches or strong washing liquids as this will cause colour run.it can be washed by hands in cool water.mild ironing gives fine touch to its quality. As these throws are hand made some color may vary from the images shown. This reflects their hand made qualities and is in no way to be considered a defect. Soft Fabric:100% polyester,fabric soft,sagging good,suitable for hanging on the wall,colorful and beautiful,do not fade.Super soft and skin-friendly,durable and fast drying. Multi-Usage:these tapestries almost can be used as for all home decor,like tapestry,wall hanging,bedspread,wall decor,wall art,bed cover,room divider,curtain,table cloth and of course as decor or throw beach,college dorm bedspread. Enhances the ambience of your living room,bed room,conservatory,study room etc. Wash Care:Wash in cold water,please do not use bleach.Wash separately / hang dry recommended. The wonderful pattern design is a great way to add color to your bed,ceiling,and wall.